After the lovely warm weather February gave us followed by the incredible winds and rain brought by Storm Gareth, Anchor Lake is looking in fantastic condition and has been fishing incredibly well. Since the 1st March anglers have been enjoying an average of just over 4 fish each with Orange Blobs, Blue Flash Damsels and Bloodworms being the favoured fly patterns. We are so lucky to be situated in such a beautiful location right on the edge of the stunning Exmoor National Park. We welcome visitors from all over the South West and further afield who are looking for that easy to reach tranquil venue. Only 8 miles from Tiverton & less than 45 minutes from Taunton or Exeter there is even more fishing available now that the river season has opened. 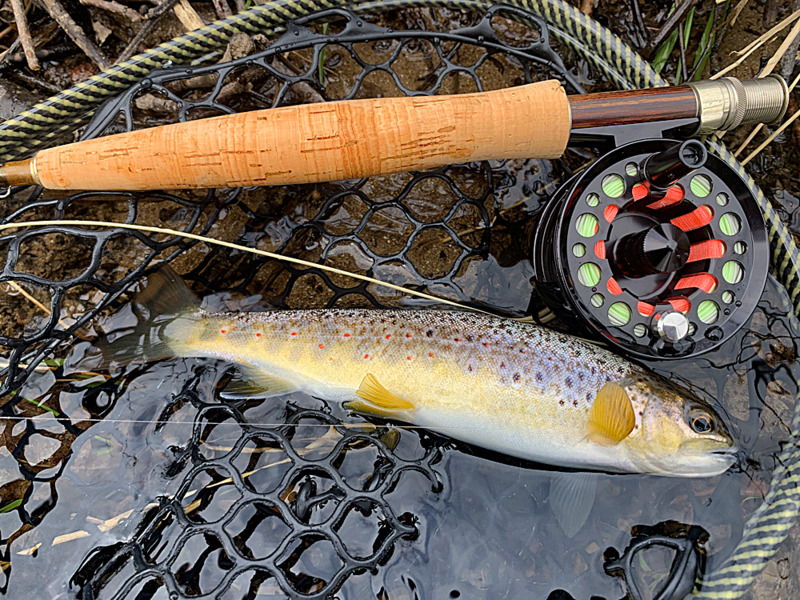 Not only do we have day tickets available on the fishery beat for the stunning River Exe wild Brown Trout, anglers can also purchase tickets for the Westcountry Angling Passport from the shop. 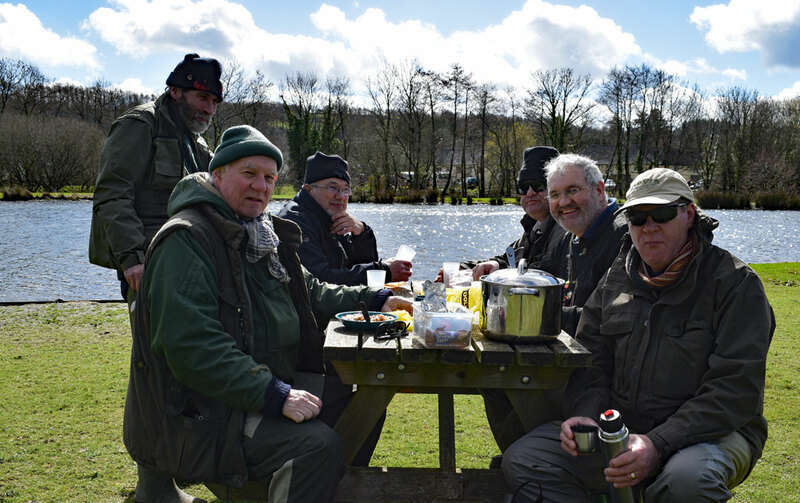 Last Sunday, Burrator Reservoir Fly Fishing & Angling Association, held a fishing competition on Anchor Lake. Anglers travelled from Barnstaple, Witheridge & Plymouth to take part and enjoyed a great days fishing with Steve Borthwick catching a cracking 9lb Rainbow Trout on a Cats Whisker fly. Steve Borthwick with his 9lb Anchor Lake Rainbow Trout caught on a Cats Whisker fly. Enjoying lunch by the lakeside- perfect! Laura, Alan & Ellie Burns from Builth Wells visited the fishery on a lovely sunny day. It was Ellies second time fishing. Thank you, Laura, for sending through some lovely photos including the first photo in this report. Laura said “Visited last Friday, had a lovely day! Had the daughter with us, and she was so chuffed to catch a fish! She cast the line out herself caught a lovely fish about 3lb in weight. It was only her second fishing outing! She missed loads, so was really pleased she managed to land one at least! Hopefully will see you again next time we are down your way visiting! We have several anglers who have almost reached their free permit. With 10 days left in March there is still time to earn yourself a free permit which can be used throughout April 2019. Special mention to Ben Cheeld & Jane Young both of whom have completed the Winter Permit Offer twice. I am really pleased to say that from today we will be able to offer fresh Exe Valley Fishery Rainbow Trout for sale from the shop. The trout will be prepared and sleeved ready to cook. The trout are available by pre-order only to guarantee you receive the freshest fish possible. If you would like to order a fresh Exe Valley Fishery Rainbow Trout please contact me on 01398 323008. Many thanks for reading this post and I hope to welcome you to the fishery soon. Thank you for signing up! Look out for fishery reports arriving in your inbox very soon. Best Fishes, Nick & Sue.